We are incredibly lucky to have so many beautiful areas to explore and stay in Perthshire with our dogs, with a particular favourite of ours being the picturesque Highland Perthshire town of Pitlochry. 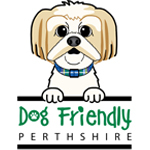 Pitlochry ticks many boxes for being so dog friendly, especially with having beautiful walks like Faskally Forest, the Linn of Tummel or for the little bit more adventurous Ben Vrackie. 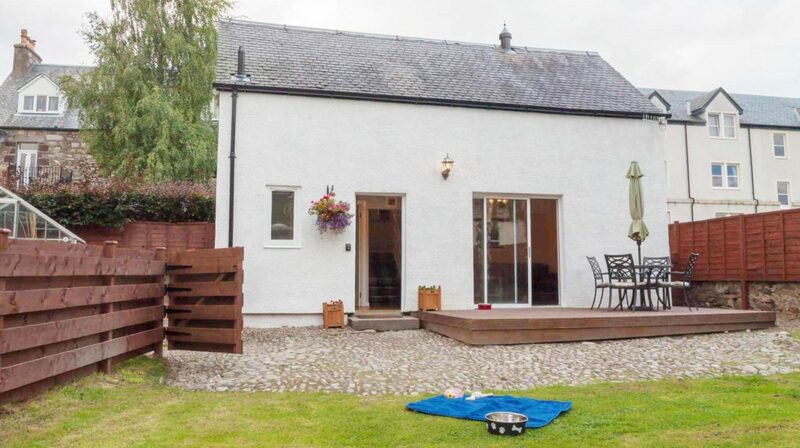 Being able to explore all these walks with Baxter was a big draw to us booking a dog friendly getaway to Pitlochry and we found the perfect place to stay at Croft Na Coille Coach House! 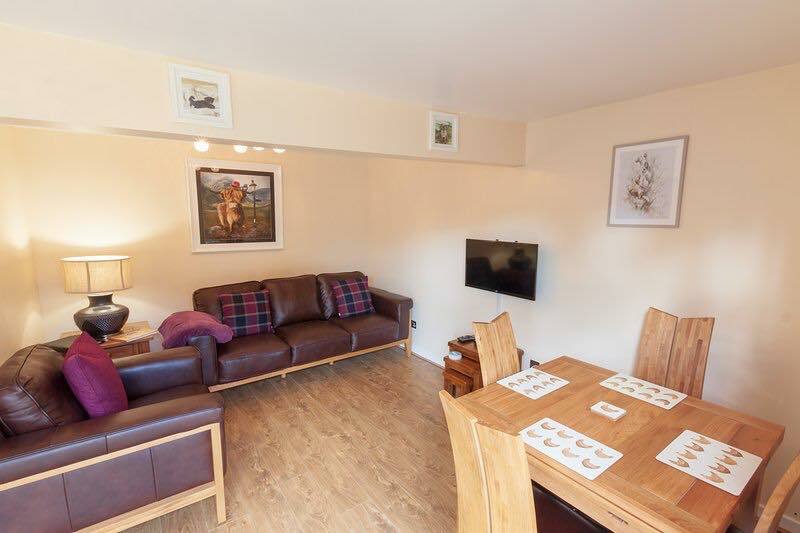 Croft Na Coille Coach House is located only a short walk from the heart of Pitlochry. It’s been beautifully and lovingly restored while still keeping its charm and even an original feature of stained glass doors inside. It has a quaint and cosy feel but still bright and light throughout. Downstairs you have a living room and dining area with patio doors that lead onto a decking area then garden. The bathroom has been renovated and a new shower put in. The hosts will also provide towels for your stay. You also have a good kitchen space that has everything you need for cooking while staying somewhere that’s self-catering. If you look out the kitchen window you will sometimes even see the resident hens who like to hang around outside! Upstairs you have two good sized bedrooms with a lot of natural light. The master bedroom has a king sized bed with lovely wooden furniture that goes with the feeling of The Coach House. The bed is one of the comfiest I’ve ever slept with the pillows, duvet and linen being to a very high standard. 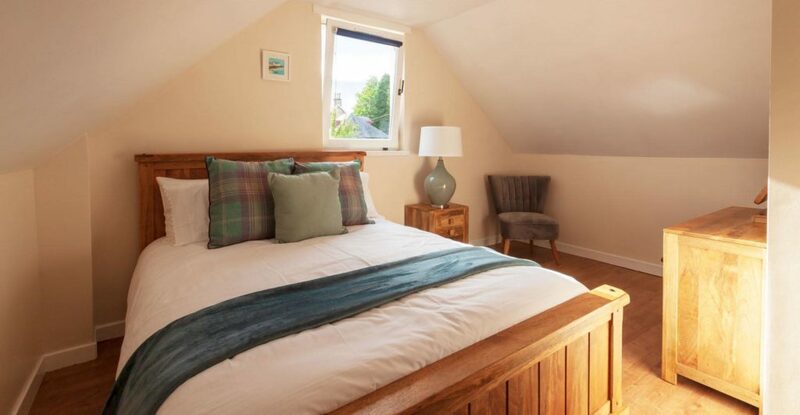 The second bedroom has two single beds with the same care taken to dress the room and make your stay as relaxing and as comfortable as possible. The absolute favourite part for Baxter though and will be for any dog and most dog owners staying is the secure garden. Each morning we opened the patio doors and had our breakfast while watching Baxter have just the best fun. The garden is such a sun trap and we were really lucky with our stay (knowing Scotland’s weather in March!) that we got lots of sunshine. In the garden, you also have a patio set, BBQ and chiminea. The hosts really have thought of everything to make sure you have the best stay possible. 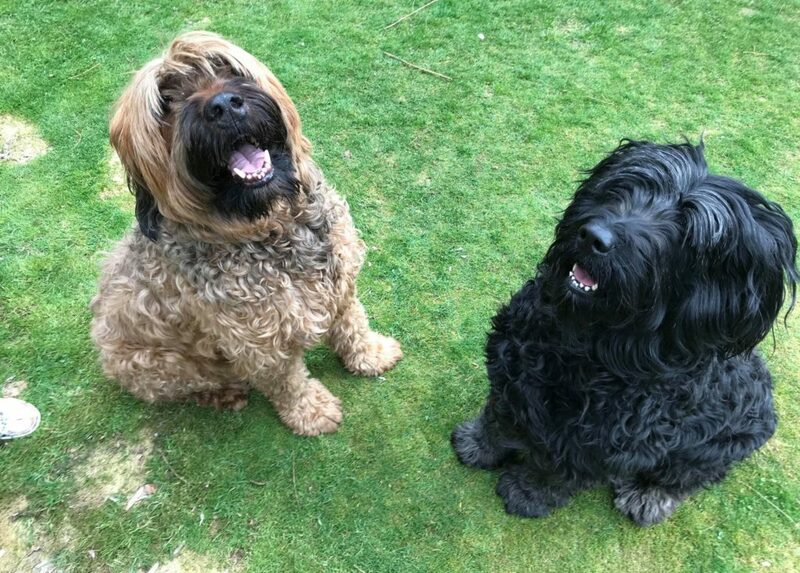 The Coach House hosts Eunice and Gordon are massive dog lovers and own two absolutely beautiful Briard’s, Yogi & Boo Boo. Yogi & Boo Boo know how important it is to us humans that dogs enjoy their holidays too so they have made up a wee welcome pack for dogs staying at the Coach House. It includes dog biscuits, bowls, poo bags, towels, a ball, bedding, a map with lots of beautiful walks to explore and a list of nearby dog friendly cafes, restaurants, shops and pubs! What I thought also was a lovely touch, on arrival there was some homemade shortbread and dog biscuits for Baxter. To me little things like that really make you feel welcome and the shortbread really went down a treat later that night with a cuppa. 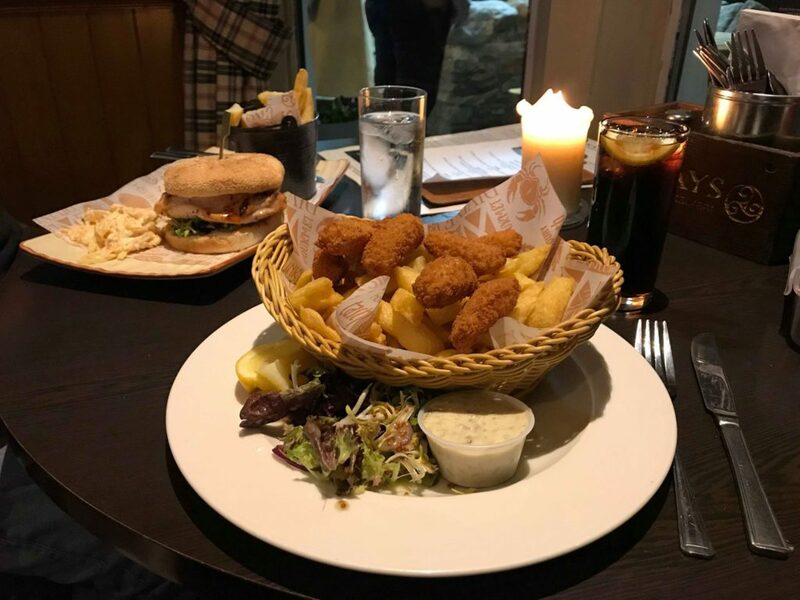 On the first night of staying we were quite tired after a day of exploring so we took a trip into Pitlochry and headed to Mckay’s Bar & Restaurant for a meal with Baxter. It’s only a short walk away so you don’t need to worry about taking the car. It is so dog friendly! In the time which we were there there was at least 6 other dogs of all sizes so Baxter was chuffed with making new pals. The food was really delicious too, good portions and reasonably priced. Having the option of going somewhere for a meal when staying away with Baxter for us is a bonus so having McKays so close by was perfect. The next day we explored Pitlochry more by visiting the tourist attraction of Pitlochry Dam which we were extremely pleased to find out now welcomed dogs. We then visited Baxter’s pal Ruby the westie at the dog friendly shop Honest Thistle were a few treats were shared between them both followed by a bit of flirting! Ending our day we thought we would pop into For Art’s Sake as I heard recently they love doggy visitors. Baxter was in his element get fussed over by everyone then we did something really fun and different with him. For Art’s Sake specialise in pottery painting and helping create beautiful keepsakes. We ended up putting Baxter’s paw in the paint (the paint is completely safe for doggies!) and pressing it on a tile so we have a special part of our boy forever. For Art’s Sake then put it in a kiln and add other touches for it to take pride of place in our home. It was a really fun and unique way to end our dog friendly weekend. Croft Na Coille Coach House was everything we needed in terms of the most relaxing and even calming dog friendly getaway. I’ve mentioned before that you are only a short walk from the centre of Pitlochry but it’s that quiet that you feel like no one else is nearby. Another thing which I’ve not yet mentioned is that if you don’t drive then don’t rule it out as a place you can’t stay as there is a train station! 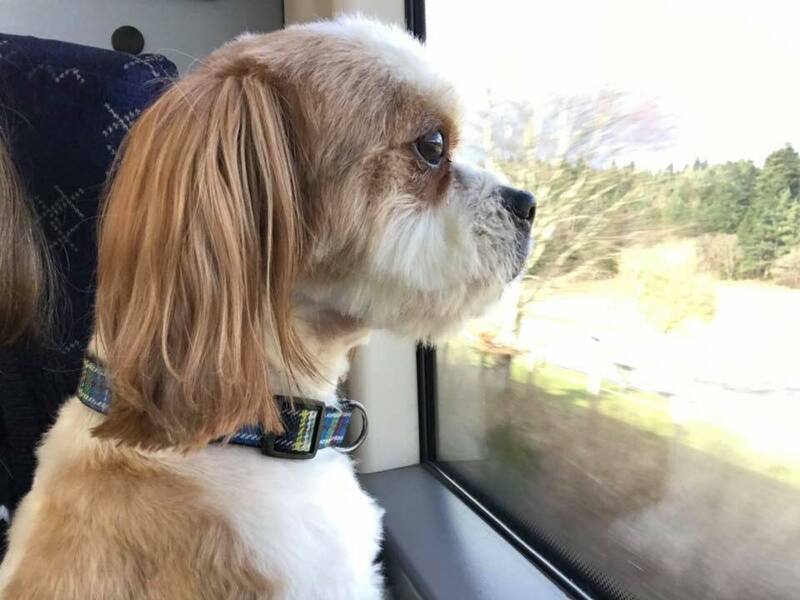 I don’t drive so Baxter got to experience his first ever train ride. He was a wee superstar and behaved so well. He was quite happy sitting on my knee looking out the window as the world went by. If you can call ahead to let Eunice and Gordon know of your arrival time as they are happy whenever possible to collect you from the station and take you to the Coach House. Croft Na Coille also offers the option of a cooked Scottish breakfast in the main house and boutique bed & breakfast. All produce is local to Pitlochry and there is even the special treat of award winning Bourtree Marmalade which is local to Perthshire. The eggs are even from Crofts Na Coille’s own chickens Gerty, Bertha and Mayfair! Croft Na Coille really is something special and a bit of a hidden gem as it offers an incredible amount in terms of welcoming you and your dog in a fantastic location. 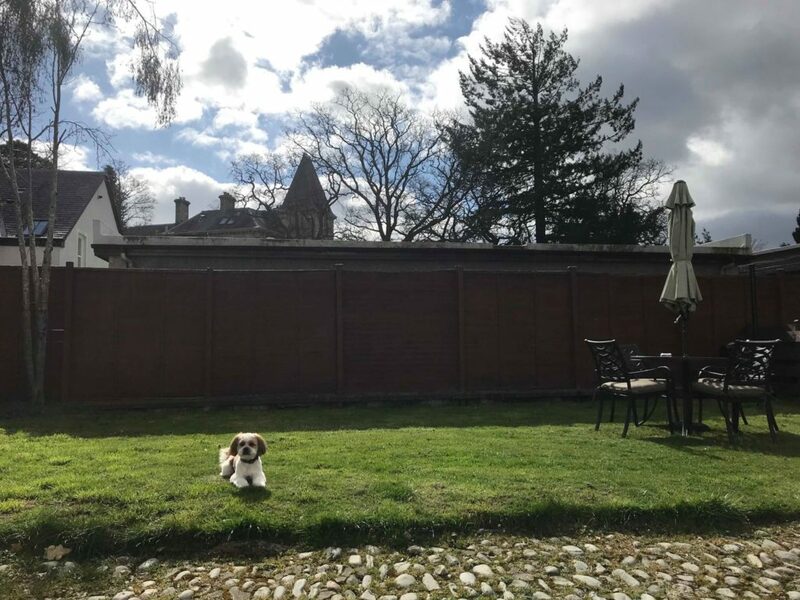 The fact that it also has a secure garden just makes it even better as it was just superb seeing Baxter’s happy face running around and playing and I know many other dog owners will feel the same. It’s somewhere we will definitely stay again and Baxter looks forward to returning too to see some of his new favourite humans Eunice and Gordon and his fur-friends Yogi and Boo Boo who all made our stay just perfect.